30" x 30" hand embroidery, beadwork and acrylic paint on lenin. Gravers Lane Gallery Chestnut Hill, Philadelphia, PA, on going. NOMA Gallery Frederick, MD, on going. has been using hand embroidery and hand stitched beadwork combined with acrylic paint as a medium for Art making for twenty some years. 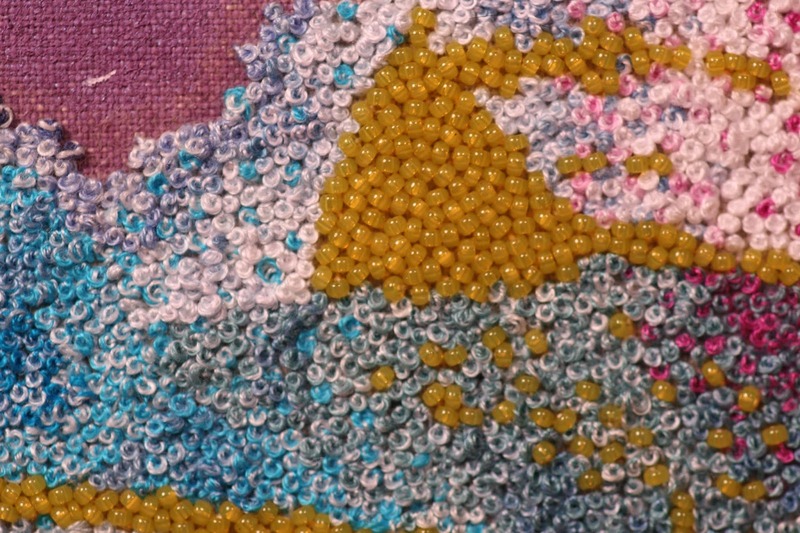 The act of hand stitching thread and beads is a slow and repetitive process that affords the space for uninterrupted thought. The act of painting is spontaneous, in the moment, physical movement. Combining these two opposite states gives form to endless exploration in to the mystery of being. I work intuitively, mining personal experiences, energy, movement, nature and the occasional external interruptions of politics. I use this medium of minutiae as a practice for connecting with the vastness. Washington Post's review of "BEAD"
"Abstract Embroideries" Volt Restaurant , Frederick, MD. "Weather", NOMA Gallery, Frederick, MD. "Advance & Retreat", Delaware Center for the Contemporary Arts, Wilmington, DE. Review, News Journal of Delaware, July 3. 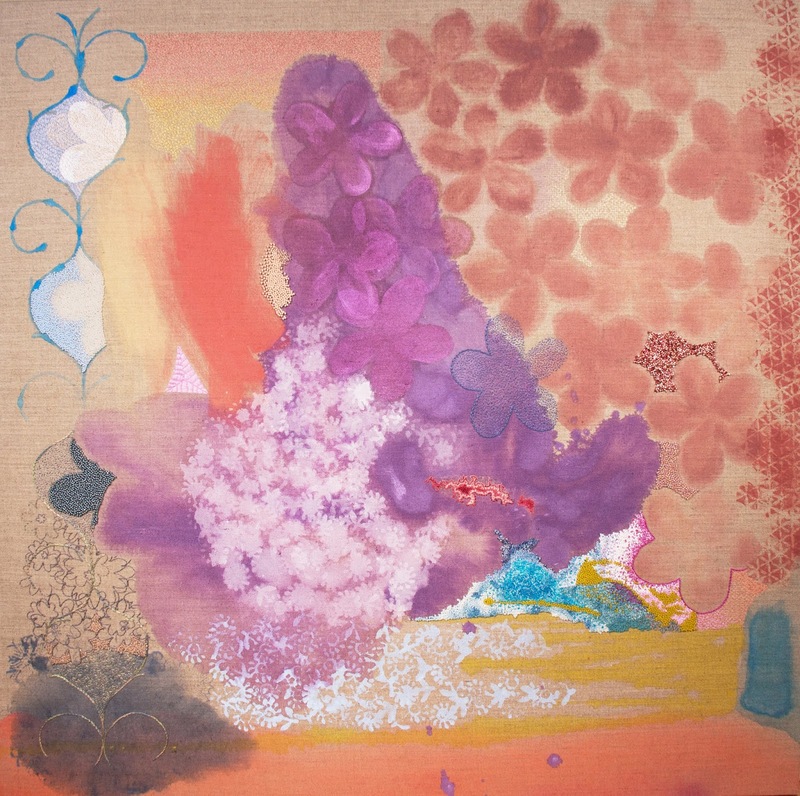 “Transition” Snyderman-Works Gallery, Philadelphia PA. Review. Philadelphia Inquirer, February 11. "Arranging Space" Montpelier Cultural Arts Center, Laurel MD. Review Surface Design Journal, Winter 2001 issue. "Winter Cycle" Rockville Arts Place, Rockville MD. Review The Gaithersburg. College, Frederick MD. Review The New Paper, April 21. "Birch, Mickey, Sheirer : Thread, Clay, Pixel" Allegany Arts Council, Cumberland, MD. "Slant Light" Poets & Artists, 505 North Gallery & Studio, Frederick, MD. "Art in Embassies Program", United States Embassy in Freetown, Sierra Leone. "Philadelphia Meets Baltimore: Concepts and Preceptions" Center for the Arts Gallery, Towson University. 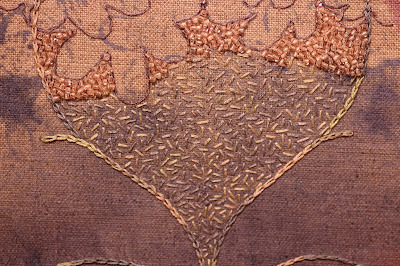 "6th International Fiber Biennial" Snyderman-Works Gallery, Philadelphia PA.
“Pricked: Extreme Embroidery” Museum of Arts & Design, NY, NY. “Landscape & Nature: A View from Maryland” Maryland- Kanagawa Anniversary Exhibition Maryland Sister States Program. "MAP @25" Maryland Art Place, Baltimore, MD. “Seeds: works by Karin Birch and Gail Gorlitzz” McLean Project for the Arts, McLean VA. Review, Washington Post, December 16. 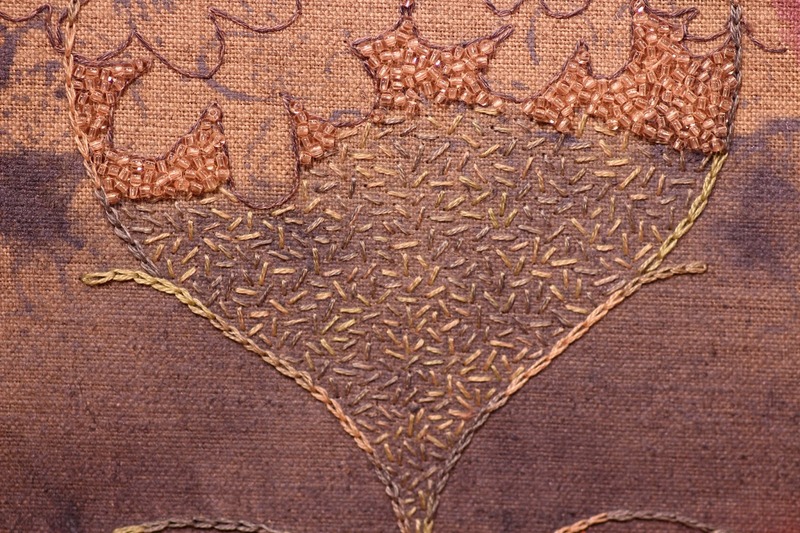 “Fiber- A New World View’ National Gallery of the Craft Council of Ireland, Kilkenny Ireland. “State of the Arts” Arlington Arts Center, Arlington, VA. Reviewed, Washington Post, January 21. “The Evocative Surface”, 4 person show, Glenview Mansion, Rockville MD. “Explorations”, Maryland State Arts Council Gallery, Baltimore MD. “100 Doves” Invitational, Washington County Arts Council, Hagerstown MD. ”SOFA Chicago” and “SOFA NYC”, Snyderman-Works Gallery. “Fiber Biennial”, Snyderman-Works Gallery, Philadelphia PA.
”SOFA Chicago” and “SOFA NYC”, Snyderman. ”Couplets” poet/ artist collaboration, SDA Conference, Kansas City, MO. Review, Kansas City Pitch. “Maryland Women in the Arts”, 3-person exhibition/ lecture, Hood College, Frederick, MD. “Art in Embassies Program of the U.S. Department of State”, American Embassy in Ghana. “SOFA Chicago” and “SOFA NYC”, Snyderman-Works Gallery. "Stitched Paintings: Embroidery in the 21st Century” DCCA, Wilmington, DE. Reviewed, Philadelphia Inquirer January 31 & Surface Design Journal, Fall 2003. “Art in Embassies Program of the U.S. Department of State”, American Embassy in Brunei. "The Audacious Bead" The Bead Museum, Washington DC. "Survey 2002" Snyderman-Works Gallery, Philadelphia PA. Catalog. Reviewed, Surface Design Journal, Winter. "Fiber Reflections" Holtzman Gallery, Towson University, Towson MD. "Uncommon Threads" invitational, Harmony Hall Regional Center, Fort Washington MD, Catalog. Reviewed, Washington Post, Oct. 26. "Beadwork International" The Dairy Barn, Athens OH, traveling, catalog. "Beadwork in America" invitational, Haydon Gallery, Lincoln NA, traveling, catalog. Reviewed, Lincoln Journal Star & World- Herald, Feb.
"Craft National 34" Zollar Gallery, State College PA.
"All Media Juried Show 2000" Arlington Arts Center, Arlington VA. Reviewed Washington Post, Feb. 4. All original images and text on this website are the property of Karin Birch.